When you think "IPA" from Tree House Brewing, you almost expect something great at this point. I've been around the block in regards to Tree House IPA's, but Haze will mark my first trip into Double IPA territory. See? The label is purple. Purple Haze? Ain't that clever? The pours comes in the classic hazy, golden orange with two fingers of white head. Lots of melon on the aroma in addition to orange and peach. There's even a slight breadiness and sugar-sprinkled grapefruit. The taste has a creamy sherbet component that I tend to associate more with big Trillium IPA's, but I'll gladly welcome it from a Tree House can. The peach is back from the aroma and in full force I might say. There's more of a pure hop juice presence on the taste that was absent from the aroma, but with its abundance, it is clearly making up for lost time. The taste contains more bitterness which has a grassy tinge, but it isn't overtaking the hop juices and fruits. The finish goes back to more of the peachy and stone fruits and it lingers for days. Mouthfeel is creamy as mentioned on the taste. This doesn't drink like a Double IPA as there is no syrupy feel or resinous bite. It drinks like a heavy single IPA, but with a big punch. No alcohol presence to be found and that 8.2% will catch up to you as you chug this one down. 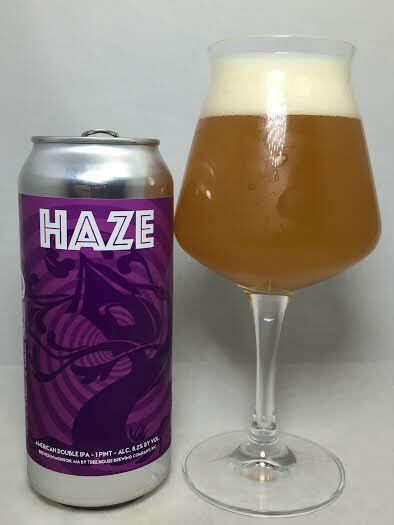 Haze marks yet another great IPA from Tree House. Packing in tons of flavor with the drinkability of a lower abv IPA, Haze will have you plowing through cans like Mandingo through Spring Thomas (don't Google that at work). This marks my first double IPA from Tree House, so I have no comparison to others, but if they are anything like this, then I have a lot to look forward to.